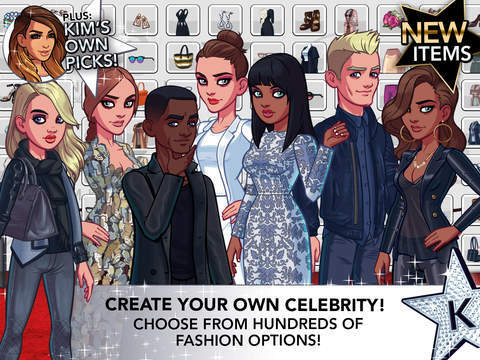 Become an A-List Celebrity with Kim Kardashian! Who are you? You're a nobody in Hollywood. You have dreams of being a big celebrity like everyone else, but dreams and your job at the So Chic Boutique are the only things you have. That's all about to change. While closing up the store after a busy evening, one Kim Kardashian steps into the door with a small tear in her dress and an offer that will set your life down a whole new path. 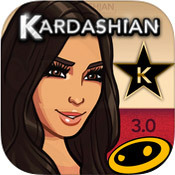 Welcome to the Kim Kardashian Hollywood app. As a young and ambitious fashionista living in modern Los Angeles, you can experience the glamorous lifestyle of a wealthy socialite as you climb the social ladder of Hollywood's elite. You'll try out the latest fashions, rub shoulders with the most popular celebrities, become the next big sensation, and you'll do it all with Kim Kardashian herself at your side. Being famous is no easy feat. Your face is going to be on TV, in the magazines, and all over the internet. When you become a celebrity, you got to do it in style. Put on a smile and your best dress; the cameras are about to flash! • Customize your look. Choose your face, eyes, lips, nose and hairstyle. • Wear the most fashionable shirts, pants, shoes and dresses you can get your hands on. • Learn how to accessorize. Pick your preferred makeup, jewelry and glasses, and go to town. You may begin as just a simple cashier, but Miss Kardashian has given you a rare opportunity to experience life in the fast lane. Don't disappoint her as you move your way up the ladder from a zero to an A-lister. • Network with managers, accountants, photographers, gossip news journalists and your fellow celebrities to open up new job opportunities. • Date the best-looking heartthrobs and increase your fame even more. • Earn money and gain experience to purchase better clothes, homes and other things that will improve your image. • Unlock achievements to earn even more rewards. With Kim Kardashian: Hollywood, you can experience the thrill and excitement of the celebrity lifestyle in Tinseltown without actually having to go to Tinseltown. Get a taste of what it means to be Kardashian herself as you let her guide you through the ways of high living. With the Kim Kardashian Hollywood game, everything is possible! A Kim Kardashian game app sounds almost like a joke. When you're famous simply for being famous, it's a little hard to imagine just what kind of a game a woman like Kardashian could star in. There are probably a great number of people who wouldn't mind an Angry Birds clone where they can launch miniature Kim Kardashians at buildings to knock them over. An app featuring her piloting a spaceship and shooting aliens would also be interesting in an absurd way. Sadly, that's not quite the case with Kim Kardashian: Hollywood. It's a comparatively more mundane experience where the player's goal is to climb the ranks of the Hollywood social scene and become a famous socialite just like her. There could be potential in that idea; there aren't a whole lot of games on any platform where you can simulate the life of a celebrity, which would indeed involve a good deal of economical and political hustle. Unfortunately, this app doesn't really do a good job at fully realizing that idea. They say celebrity is overrated in real life, and it appears to be the case in this game as well. Aesthetically, the app works. It's got a cartoony feel to it that's playful and bouncy. The scenery is sharp, crisp and layered to give the world some depth, and the game does what it can to emulate the hustle and bustle of Hollywood as we know it by animating cars driving in the background and people just milling about. There's a good variety of locations to go to as well, like the streets of Hollywood, assorted clubs, photo studios, talent agencies, and your starting apartment. Characters are drawn to great detail as well, and they're animated enough to seem alive. Most impressive of all are the number of ways you can customize your avatar. For a game where every character is depicted as a two-dimensional sprite, there are plenty of options to determine her looks by choosing from several facial structures, eye shapes, noses, lips, hair styles, skin colors, and clothes. Making a distinctive character is very easy to pull off, and it's always a nice accomplishment to expand her wardrobe and dress her up in more stylish clothes. Best of all, she's just as animated and detailed as the rest of the cast despite her modular nature. Unfortunately, the visuals are probably the best part to Kim Kardashian: Hollywood. While the folks over at Glu Mobile have spent a lot of time dolling the app up, they're hoping that and Kardashian's name alone will be enough to sell people on it. The game doesn't feature any real strategy. You're not making much in the way of meaningful choices, calculated risks, or necessary sacrifices. All you really do is tap buttons as they come up. Need to pose for a photo shoot? Just tap all the little circles. Have you been asked to close a register? Tap it and it will be done. There is no wrong thing to tap, there is no rhythm to tap things to, and there are no taps you can miss. You just tap and collect the money, energy and experience that falls out. It's utterly mindless, and that's when you're actually playing the game. 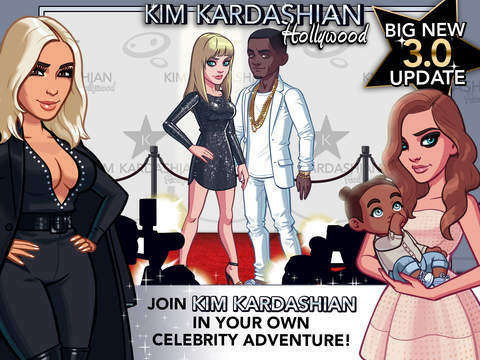 Like many freemium apps, progress in Kim Kardashian: Hollywood is also made by simply waiting. Sometimes, you may need to wait for hours just for a certain gig or social event to end so you can make your money, increase you fame, earn your fans, and get on with it. This can hardly be called a game; it's like a more interactive version of the satirical "zero-player game," Progress Quest, albeit with much less irony. The story that you play through is also nothing to get excited about. If you're expecting any sort of drama or conflict to get serious about, you can forget about it. Scene after scene consists mostly of characters heaping empty praise onto your flat avatar if her fame is high enough, arrogantly dismissing her if it isn't, or treating Kardashian as if she's the greatest thing since sliced bread. You'll occasionally be given a choice on how to proceed, particularly once you start to hit the date scene with other celebrities, but these don't really change anything. You might make a little less money for doing this, you'll lose some fans for doing that, but the only real consequence you'll suffer is that you'll have to wait a bit longer to recuperate your losses. That's assuming you don't pull out your credit card first. If there is perhaps one redeeming value to the story, it's that it does intersperse a good amount of genuinely funny material here and there. For instance, there's a rival you encounter early on named Willow Pape, who's basically every negative blonde stereotype wrapped up into a neat package. She's utterly self-absorbed, blames all of her problems on you, the Illuminati and ObamaCare, speaks in internet lingo, finishes her spoken sentences with hashtags, and writes hilariously petty insults about you on her Twitter account just to wreck your reputation. Ironically, while Pape is clearly meant to be someone you're supposed to hate, her comical personality makes her far more endearing than most of the friendly characters in the game, Kardashian included. She also comes across as a satire of the shallow materialism that the app otherwise glorifies, which is a breath of fresh air for those who don't really fantasize about this sort of thing. Kim Kardashian: Hollywood is not an enjoyable product. It's by no means frustrating, but it won't get your adrenaline pumping either. It's mostly just busywork. The glamorization of celebrity and everything that goes with it, including paparazzi, sleazy agents and pompous socialites, will bore those who don't care for it at best, and likely offend them at worst. The humor can be a nice distraction, but a game needs much more than that to be good. The ways you can personalize your paper doll avatar are extensive and fun, but there are better games for that. You have to be a real fan of Kim Kardashian to enjoy this app, and even that's not a guarantee that you'll want to stick around.